The history of zinc being used for treating skin conditions goes as far back as the 13th century. We won’t be going so far back, though. We will, however, tell you all about this mineral and why it has found its way into today’s creams, make up, and yes shampoos. What Is Zinc and Pyrithione Zinc? What Can It Do For Your Hair? Reliable anti-dandruff formula with predictable results at a great price. Great anti-dandruff action and leaves soft and shiny hair after wash. Maximum strength pyrithione zinc shampoo with salon quality results. Zinc is a “mineral”. Pyrithione zinc is one of its forms and is mainly used in shampoos. The other forms in which we find zinc in cosmetics are zinc oxide and calamine. Broadly speaking zinc is a very important and essential mineral for a lot of body functions and processes. Although it has many other functions, talking from the perspective of just skin and hair, it has a critical role to play in the production of collagen in the body. Collagen is essential for the growth of healthy skin and hair. Why zinc has found its way into cosmetics, skin, and hair care products can be explained by its astringent, anti-inflammatory, and healing properties. This makes it a great inert bulking and coloring agent when it comes to make up. Further, its astringent properties help calm oil glands, which is why it is commonly found in acne clearing creams too. Its ability to remove free radicals and reduce the oxidative stress on the skin makes it an ideal ingredient for anti-aging creams. Another great property of zinc is that it is inert and not easily absorbed in the body. This makes it a great ‘barrier’ in various specialized formulations like sunscreens and diaper rash creams. What Can Pyrithione Zinc Do For Your Hair? 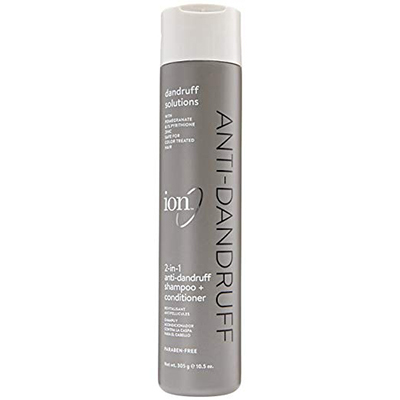 Pyrithione zinc helps counter dandruff and seborrheic dermatitis: An undeniable benefit of pyrithione zinc for hair is that it eradicates dandruff and helps seborrheic dermatitis. However, it’s not known whether this effect is due to the fact that zinc improves the general quality of scalp skin or if it has an inhibitory effect on the oil glands. What is worth noting is that while other anti-dandruff agents like coal tar and salicylic acid work on the symptoms, pyrithione zinc seems to work against the cause itself i.e.the malassezia residing on the scalp. This is probably why the anti-dandruff effect of pyrithione zinc is much more long-lasting than other active agents. While there aren’t many studies on the mode of action of pyrithione zinc on dandruff, there is an irrefutable link between zinc deficiency in the body and various types of dermatitis. Pyrithione zinc has a role to play in stopping hair loss: Dandruff has a logical relation to hair loss. Dead skin and flake accumulation tend to block the hair follicle and hinder proper and healthy growth of hair. The itchiness associated with dandruff and seborrheic dermatitis also contributes towards hair loss due to breakage. 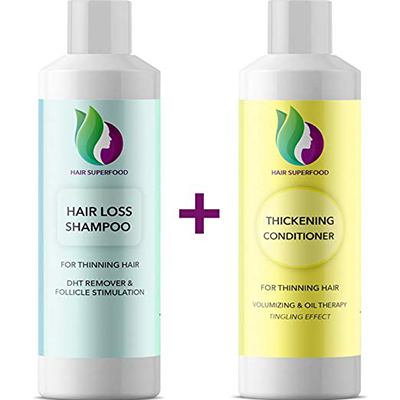 When a pyrithione zinc shampoo is used to wash the hair, the resolution of dandruff and itchiness automatically leads to stoppage of hair loss and thinning hair. 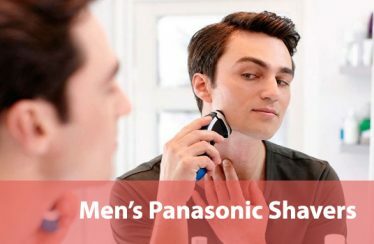 In fact, there was a study done in 2003 to see the effect of a 1% pyrithione zinc shampoo, minoxidil, and a combination of both on hair density. 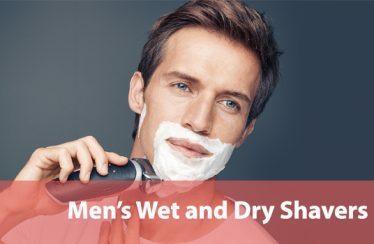 This 6 months long study comprising 200 participants showed that after 9 weeks there was a considerable increase in the hair count for the 1% pyrithione zinc shampoo, minoxidil, and the combination group. However, it’s worth mentioning that the minoxidil group performed slightly better than pyrithione zinc group (source). Pyrithione zinc takes care of smelly hair: Oily hair can lead to dandruff but it can also lead to smelly hair. When the excess oil secreted in the follicles is not cleaned properly, it breaks down and starts giving off that typical scalpy-smell. Pyrithione zinc has astringent properties. Therefore, it makes a very good cleanser. It can clean the scalp and rid it of bacteria. This is probably why it makes for a great deodorizer too. 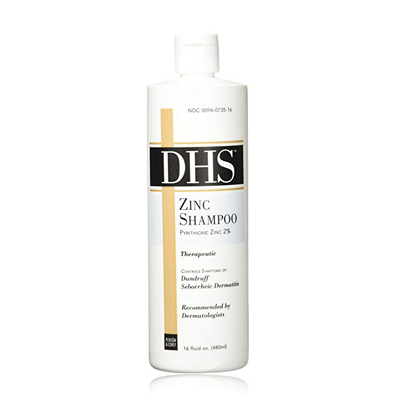 I guess it’s no surprise that the first pyrithione zinc shampoo on our list is Head & Shoulders. This company has worked so hard on this formula that their name has become synonymous with anti-dandruff shampoos. Sticking true to their mission, this clinically proven product promises to fight dandruff and remove other associated symptoms like itch and dryness. It has a three action formula that cleans the hair thoroughly, protects it from further dandruff, and also eliminates dryness in the process. Yet, it is suitable for all hair types and gentle enough for daily use. This product does what it claims. It is not only very effective against dandruff, flaking, and itching but will also keep your hair soft. This may be attributed to the fact that this is a 2-in-1 product, which means that it is a combination of a shampoo and a conditioner. Since it is a pH balanced formula, it is also gentle enough for users with color-treated and chemically treated hair. 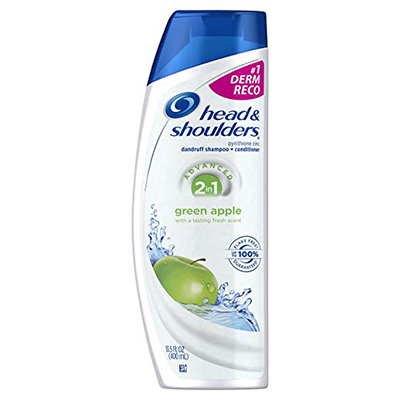 The shampoo has a crisp green apple scent that many users love as well. However, there is no product on the market that can please 100% of the users. So with this one too, some users have complained of dry hair and scalp after use. Similarly, there are also claims of oily hair after washing and even worsening of flaking problems. That being said, this is a very small percentage of users. The product is available in a single, double, and a pack of 6. The pack of 6 is the most economical at about $16.14. Who’s it for: If you’re looking for a no-fuss everyday shampoo that will free you from dandruff, itching, and the hassle of a conditioner, try this. Heck, just try it if you want the delicious and fresh smell of green apple in your hair. This soap bar has found its way into our best shampoo list because it is wonderful when used as a shampoo. Moreover, it has a natural element to it as well which makes it even more attractive. If you’re looking to try some pyrithione zinc on your hair, you’ll be missing out if you let this one pass. Also, we had to consider the fact that that dandruff, flaking, and itching as more than just problems of the scalp. In so many cases, users have complained of flaking on the scalp as well as parts of the face. This is very common in seborrheic dermatitis or even psoriasis cases. So, we picked this soap bar that is 2% pyrithione zinc and can be used both on the hair and face. Even though most users have only used it on the face, the ones that did use it on the hair reported relief from symptoms just after a few washes. Another great thing about this soap bar is the natural ingredients in it, which makes it a sulfates and parabens free product. This means that it is gentle for daily use and can also be used by children. It is odorless and one bar goes a long way if stored carefully. This is a two bar pack, so 8 ounces of the product is available for around $12.95. Who’s it for: If you’re suffering from seborrheic dermatitis, psoriasis, or eczema, and are tired of using separate products for your hair and face, try this. 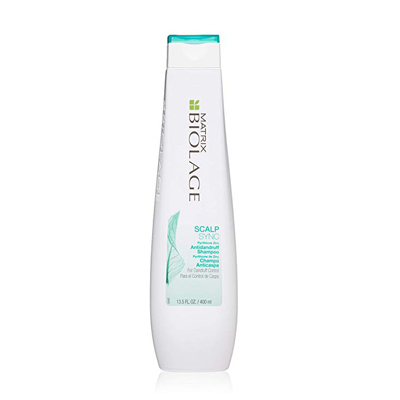 So, this shampoo by Matrix Biolage is the number one choice for users for whom Head & Shoulders has not worked. 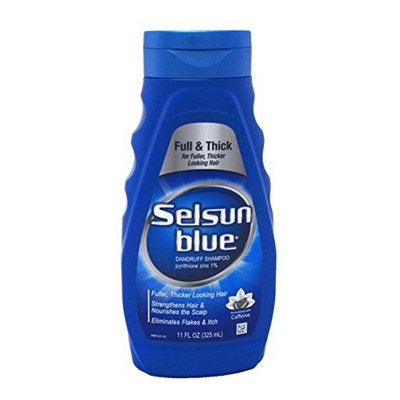 There are also users who have not been satisfied with either H&S or Selsun Blue but love this shampoo. Along with pyrithione zinc, this formula relies on the anti-bacterial and calming properties of the Mint Leaf to give relief from dandruff and itching. Users report immediate relief from visible signs of dandruff i.e. flaking as well as itchy and irritated scalp. The number one benefit that this product has over H&S and Selsun Blue is that it leaves hair feeling really soft and smelling heavenly. That is the reason why this creamy formula is loved and favored by hairstylists and salons. Another reason might be that it is good for all hair types. While it’s not really a budget shampoo at around $18 for 13.5 ounces of product, this product is totally worth the price. Who’s it for: If you’ve tried Head & Shoulders and Selsun Blue but they haven’t worked for you, then try this. It will not disappoint. So, there are only a few 2% pyrithione zinc shampoos on the market and this one tops the list when it comes to efficacy. Even though the company is not marketing this fact, we’ve found that this shampoo was recommended to a lot of the very satisfied users by their dermatologists. 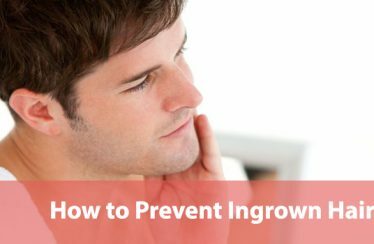 Not only does it provide relief from itching and flaking, but it is also very effective when it comes to helping with seborrheic dermatitis symptoms. It is exceptional at calming irritated and inflamed skin but that is not even the best part. The real clincher is this shampoo’s salon quality outcome. The formula, even with 2% concentration of pyrithione zinc, can compete and beat the best salon quality shampoo when it comes to the post-wash effect. It has a luxurious foamy wash quality, and even though it contains sulfates, it leaves your hair feeling absolutely soft and conditioned. One user actually compared the after-wash experience to that matching a very pricey shampoo like Oribe. Moreover, there are very few users complaining of dry hair after washing with this formula. Users that have not been entirely satisfied with Head & Shoulders and Selsun Blue are also happy with this shampoo. Another great thing about this one is that it has, according to users’ descriptions, a medicinal but mild and pleasant smell. It is safe for all types of hair and only needs to be used twice a week. You can get 16 ounces of this product at around $20.43. Who’s it for: If you have mild to moderate dandruff or seborrheic dermatitis and are looking for a more potent formula, then try this 2% pyrithione zinc shampoo. It will even rival any salon style shampoos for the way it leaves your hair. 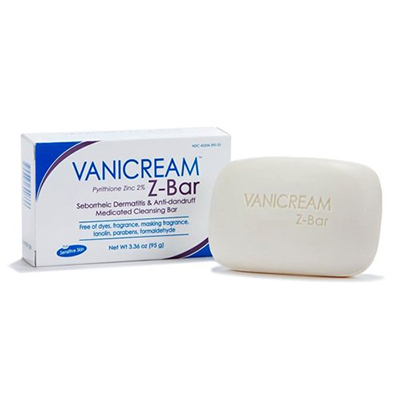 The Z-bar by Vanicream is another great 2% pyrithione zinc formulation. However, this formulation is presented in the form of a soap bar. The company behind this brand is PSI. PSI was formed to meet the need of people with sensitive skin for mild skin care products, specifically on the advice of multiple dermatologists. It’s no doubt that today it is known for its gentle formulations and for using only minimal but effective ingredients. It is because of this reason that this product is treated as one of the go-to solutions by dermatologists treating people with sensitive skin. Despite being so gentle, this soap bar still packs a powerful formula that is very effective at curing symptoms of dandruff, seborrheic dermatitis, eczema, and even psoriasis. Users report immediate relief in symptoms after just a few washes. Again, even though this product is incredibly effective in general, its true quality comes to the fore in cases of sensitive skin. The company specifically mentions that this soap can be used, both on the body and the scalp. However, it is understandable that most users have only used it on the body. Nevertheless, our research has shown that it has all the makings to be a product that can be used on the scalp as an effective anti-dandruff and anti-seborrheic dermatitis solution. This soap bar lathers well too. This is surprising since its formulation doesn’t contain any sulfates. It is also free of other unnecessary ingredients such as dyes, fragrances, parabens, gluten, lanolin, and formaldehyde. 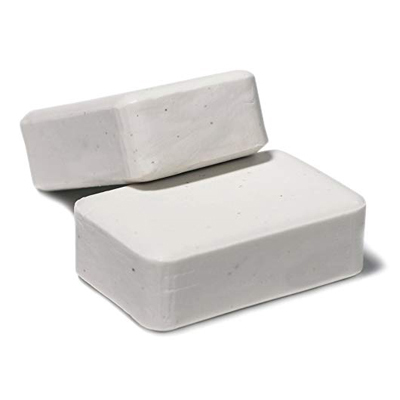 You can get two soap bars (3.36 Oz per bar) at around $15.97. Who’s it for: If you are suffering from dandruff or seborrheic dermatitis on your scalp as well as other parts of your body, you must try this product. Also, go for this one if you have sensitive skin that is irritated by needless synthetic or even natural ingredients common in commercial products today. Effective against symptoms of dandruff, seborrheic dermatitis, eczema, and psoriasis. Free of sulfates, gluten, dyes, fragrance, masking fragrance, lanolin, parabens, and formaldehyde. This is another in a great line of dermatologist tested and recommended products from PSI. The entire range of products that this company makes is aimed at users with sensitive skin and this medicated, anti-dandruff shampoo is no different. This maximum Over-The-Counter (OTC) strength pyrithione zinc (2%) has potent antifungal properties. 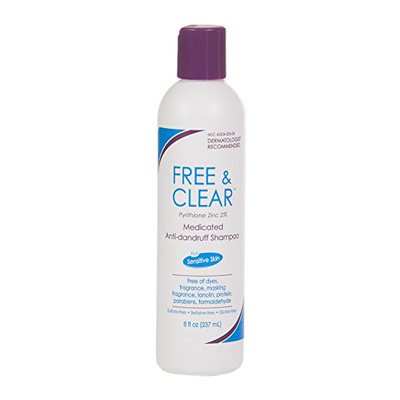 This makes this product an incredibly effective defense against symptoms of dandruff and seborrheic dermatitis. However, what sets it apart from other products is the fact that it is formulated to be mild and allergen free. Let’s be honest here. It isn’t a small feat to formulate a mild but effective product. When it comes to efficacy, many users report almost immediate relief from itching and flaking. There are also many saying that it works better than H&S Clinical Strength formula and has none of the associated irritating smells that linger. Users with a very sensitive sense of smell have hailed this product quite lavishly. On the other hand, people suffering from eczema and even psoriasis have reported using it to successfully cure their annoying symptoms. While this product is great for oily hair, it may not be as flawless for people with dry hair. Some users with dry hair have suggested that this shampoo dries their hair even more. Another small issue for users with a special affinity for lather may be that this product doesn’t produce a lot of lather. This is true for many shampoos that don’t contain sulfates. So such users may have to resort to using sulfate-based shampoos or make peace with the fact that lather isn’t necessary for a thorough cleansing. Already, there are users who have moved past this little limitation by focusing on this shampoo’s amazing anti-dandruff qualities. You can get an 8 ounce bottle for $8.99, which is very competitive in a saturated market. The pricing begins to look even better when you consider the fact that this product is so effective that you won’t have to use more than twice a week. Who’s it for: If you have ever had an adverse reaction to Head & Shoulders or any other OTC pyrithione zinc formula, try this one. It has no allergens, irritants or even added artificial fragrances but remains potent enough to compete with the best anti-dandruff shampoos in the market. If you’re a fan of styling or coloring your hair you would already be well acquainted with this professional hair care brand, ION. Their anti-dandruff, 2-in-1 shampoo contains 1% pyrithione zinc as its active ingredient and makes it into our list because of its ability to deal with dandruff while keeping styling in mind. Its formulation is also notable because it contains pomegranate extract. Not many people know that pomegranate is a great source of punicic acid. In recent times, punicic acid has shown to be very effective against treating almost all common hair problems like dandruff, itching, and dryness. Also, it supports healthy hair growth by improving the blood circulation to the scalp. So, how does this product actually fair on its promise of relieving you of dandruff and itching? Well, the users have no complaints as far its anti-dandruff action is concerned. Many also say that it has effectively reduced flaking and decreased itching as well. Not only that, since this is a 2-in-1 shampoo, many users report that it leaves soft and manageable hair after a wash. The only minor drawback of this shampoo is that it may not work for severe dandruff or seborrheic dermatitis. That may be because this shampoo has been made primarily as a professional solution for color-treated or chemically treated hair. Clinical strength formulations the ones you want for severe dandruff conditions. 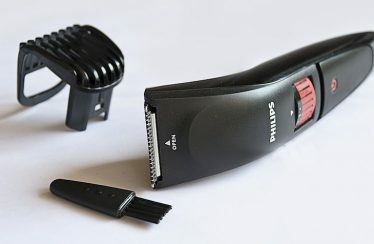 It is safe to be used every day by users with different hair types. A 10.5 Oz bottle of this product is available for about $12.35. Who’s it for: If you have color treated or chemically treated hair and are looking for a good anti-dandruff shampoo, this should be the first one you try. Yes, Selsun Blue primarily uses selenium sulfide in its formulations. However, since Head & Shoulders veered off in Selsun Blue territory with their selenium sulfide shampoo, Selsun Blue decided to come out with their own 1% pyrithione zinc formula. Their selenium sulfide shampoos have been crowd pleasers and keeping up with the trend, this shampoo does not disappoint either. It even has caffeine and vitamins in the formula for nourishing the scalp and strengthening the hair. Along with that, this product also promises fuller and thicker hair along with its anti-dandruff action. User reports corroborate the effectiveness of its anti-dandruff action completely. In fact, according to these reports, it only takes a few washes for their dandruff problem to disappear nearly without a trace. 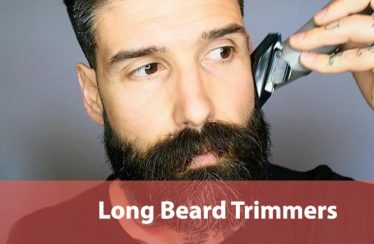 Many users also love the way it leaves their hair. Users with oily hair report that it leaves hair feeling soft but not too weighed down. As for the “thicker and fuller” hair claim, we feel that it’s too soon to tell even though a few users support it. All in all, it is a good attempt by Selsun Blue at making a pyrithione zinc formula. It is safe for everyday use and you don’t even have to worry about orange tinged hair. The shampoo also smells better than most other Selsun Blue shampoos, going by user reports. 11 Oz of this product is available for around $11.82. Who’s it for: If you’ve loved the other Selsun Blue anti-dandruff shampoos, you will absolutely love this one too. Try this especially if you have thin or fine hair. This is another great maximum strength formula created by Onto Inc. 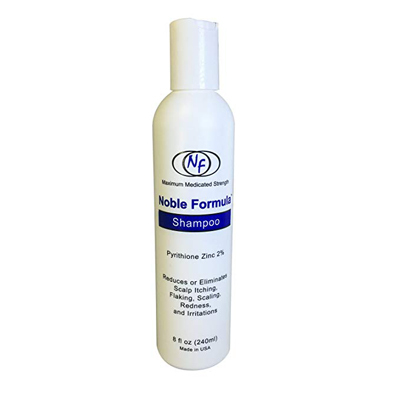 This Noble Formula shampoo derives its name from a patented formula created by Dr. Richard Faiola. The formula is basically pyrithione zinc, sodium lauryl sulfate, isopropyl myristate and alcohol. It promises to relieve dryness and itching related to a host of scalp conditions. It works great for dandruff, seborrheic dermatitis, eczema, but especially well for psoriasis. The users agree and have been reporting relief from a wide array of long-standing and severe scalp conditions, ranging from mild flaking to rosacea. This shampoo is also a favorite of people with a sensitive sense of smell because it is completely fragrance-free. Where irritating smells in shampoos are concerned, comparisons with H&S are quite common. In such comparisons, this shampoo comes out on top. In fact, the difference is significant enough for a lot of users to view this shampoo as a superior product to H&S options. The company recommends using this shampoo twice a week. Even so, if you need, you can probably use it more frequently without any downsides. You should be mindful of the fact that instances of dry hair after washes have also been reported. The solution to that, coming from the users themselves, is following it up with a great conditioner. An 8 ounce bottle is available for about $20. Who’s it for: If you have sensitive skin or dislike strong odors, try this product. It is effective but mild, which is a rare quality for shampoos to have. Even though this product is not specifically marketed as a Pyrithione zinc shampoo, it does contain this ingredient. Why it makes it to our list is simply because with this shampoo and conditioner set you get so many more benefits than just anti-dandruff properties. It promises to promote hair growth, reinvigorate scalp, reduce frizzy/static hair, and make hair soft while taking care of the dandruff symptoms. All those extra benefits and qualities are there because its formula contains tea tree oil, essential oils, antioxidants, lavender, and rosemary along with pyrithione zinc. While this combo is rare enough to promise a great deal, we are only concerned with the pyrithione zinc action in this formula. According to users, this shampoo’s pyrithione zinc action is nothing short of “amazing”. Not only does it remove immediate symptoms of dandruff, itching, and flaking but also leaves hair feeling clean and smelling amazing. The conditioner in this set works amazingly well with the shampoo too. This is evidenced by user reports of very soft and silky hair after washes. On top of all this, this shampoo improves the general quality of hair in myriad ways as well. For instance, it is known for resolving frizzy hair and split ends. It’s great for use on all types of hair and is safe for color and chemically treated hair too. It seems to suit users with sensitive skin as well and delivers on all its promises without any side-effects. You can get this set for about $17. Who’s it for: If you are looking for more than just a pyrithione zinc hair shampoo that treats dandruff, go for this one. It stops hair loss, promotes hair re-growth, strengthens hair, all the while treating the problem of dandruff. Stops hair loss, makes hair soft, promotes hair regrowth, strengthens hair, treats frizzy hair, and removes split ends. Some users find the smell to be a bit overwhelming.